This week’s honoree: Technical Large Animal Emergency Rescue, dedicated to the education of rescue personnel and horse owners. Each Friday, Horse Nation teams up with Ovation Riding to spotlight an individual or organization that is doing good work in the horse world. This week we salute Technical Large Animal Emergency Rescue. Imagine your worst fear as a horse owner: barn fire. Trailer rollover. Horse trapped in a frozen pond. There are crises that we cannot handle on our own without the assistance of emergency personnel, many of whom are not horse owners themselves — but thanks to Technical Large Animal Emergency Rescue, more rescue personnel and horse owners alike are being educated to better assist with large animal emergencies. Technical Large Animal Emergency Rescue (TLAER) is defined as “the practical considerations, behavioral understanding, specialty equipment, techniques, methodologies and tactics to perform safe extrication of a live large animal from entrapments (trailer wrecks, ditches, mud, barn fires) in local emergencies and disaster areas. Torque with a firefighter demonstrating barn fire extrication. We provide this training to get firefighters some experience with responding to a simulated barn fire, and to show horse owners how dangerous they are and why you have to have stall doors to the outside as well as many other prevention tips to prevent the fire in the first place. TLAER, Inc. works to provide education and outreach nationwide and internationally for emergency responders (whether local, state or organizational) in safer and more efficient ways to prevent prepare and respond to large animal incidents on our highways, communities and facilities, based on cutting-edge research and development. TLAER’s president, Dr. Rebecca Giminez, kindly took some time to answer our questions about Technical Large Animal Emergency Rescue. Can you define TLAER as an organization? TLAER, Inc. is a company that was built by its founders to provide cutting-edge educational opportunities to emergency responders (veterinarians, horse owners, firefighters, law enforcement, animal control, etc) that expect to respond to, or attempt to prevent and mitigate the effects of, emergencies and disasters with large animals in their communities. After about 10 years of doing training courses and starting to write a textbook, we incorporated the business as TLAER, Inc. and registered our logo and name. I fervently hope that by the time I retire (not any time soon!) that large animals, especially horses, will be served with more consistent and safe methods of technical rescue and extrication than they are currently — and that the days of jerking a horse out of an overturned trailer or a cow out of a bog by its tail or head will be nothing but a horrific memory. Torque (the real horse) demonstrating a forward assist with webbing – students learn to do these simple applications of webbing to be able to remove a horse from the mud or out of a ditch and still use his legs. The worst thing you can do is pull on a stuck animal’s head… and unfortunately many people do. What kind of courses are you teaching, and who are your students? TLAER courses are offered at the Awareness level (interested personnel from all organizations and response levels,) Operations level (hands-on, intense training events with live horses intended for live responders,) and Technician level (for USAR teams only.) Students include private horse owners, emergency response services, veterinarians and animal control officers. The TLAER training courses bring together people from all disciplines and introduce the latest concepts, techniques, procedures and equipment being used today –to learn to work together on a scene and build a great incident action plan, then extricate the animal safely for both the animal and responders. The primary instructors communicate and network with people all around the world to develop innovative tactics, techniques and procedures to share with their students. TLAER, Inc’s ongoing research and development focus on simple and practical applications with student-suggested improvements. Courses are updated constantly, allowing students to learn the most current methods and equipment in each course. Instructors are horse and cattle people so they know about the behavior of animals and people and how that applies on-scene. NYPD using their mannequin version of a horse (Resquip, Inc.) to practice getting a mounted police horse out of the mud or a ditch in a TLAER training event in 2013. 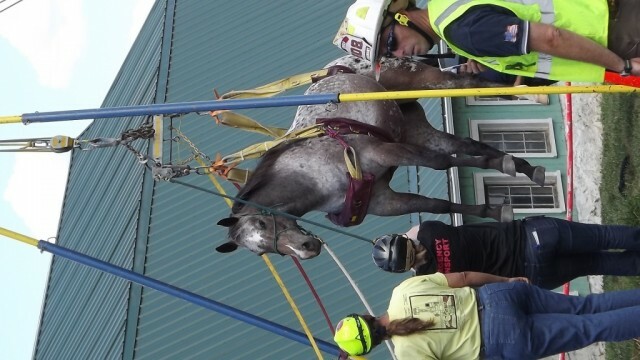 Here the responders are attempting to stabilize the “horse” and get a halter on before using special tools to get webbing around it for a vertical lift. The ring is to keep his head floating above the mud. This “horse” is STUCK in that mud. TLAER uses trained live animals for scenarios and practice rescues. 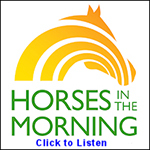 How are these horses trained for this highly-critical role? The horses may be asked to do any one of the following: training demonstrations under helicopters, tied down on a Glide, suffering a fake injury, jumping into water, lying down for webbing and rope manipulations, or acting scared while running loose for containment training. These demonstrations can be dangerous if the animal panics, so we always discuss safety zones and proper reaction to the situation with students before using the live horses. Through natural horsemanship methods, the demonstration animals are trained to confidently accept all the people (whether experienced or inexperienced,) nighttime practical exercises, loud noises, equipment and the environment in which they are placed. They can lie down on command and allow us to touch them with ropes and webbing. Training animals for TLAER starts at birth. Torque the real horse demonstrating the Becker sling and a vertical lift out of a ditch. In real life you would always sedate the horse for this – but he is trained to demonstrate this and is not sedated in the photo or video… but he likes lots of treats for his work. All of the training comes down to trust: you can never let the animal get injured or scared when learning to perform the task. I break it down into small tasks — for example, if i want a horse to learn to stand up on a three-foot high platform, I start with asking him to put one foot, then two feet, on a shorter platform, and reward him for the try. Once he understands what I am asking, he will eventually put all four feet on the platform. These exercises translate to putting their feet in the trailer, going into a mud hole or ditch, and waiting patiently while we explain techniques, tactics and procedures. Without the cooperation of these animals, most of the images and hands-on contributions to TLAER would not have been possible. The instructors consider these animals to be their close family members and value the relationship they have created over time. Aerial in a simulated barn fire being led out by a firefighter using an emergency rope halter. Horses aren’t this easy to catch in a stall when Darth Vader shows up – Aerial is “sort of” used to getting caught by weird humans in weird suits! What’s the most important advice you have for horse owners or rescue personnel, either when working in an emergency situation or regarding prevention? 1. Assuming they should be the animal handler: many horse owners or horse-lovers who respond to a scene are far too emotional to be right up close and personal with the horses in these situations. As an analogy, just because you are a parent doesn’t mean you would be invited to help paramedics and firefighters working on your child. 2. Getting too close to the animal: horse owners tend to overestimate how much their animal “loves them,” and then anthropomorphism leads to dangerous body positioning and extrication approaches. Animals don’t think in these situations; they react. Although the horse may not intend to injure you, it can easily do just that in a struggle to save itself. 3. Believe that if the animal is just “lying there” that it will not move: animals will initially struggle to the point of exhaustion, appearing to relax in an attempt to catch their second (or third, or fifteenth) wind. The slightest stimulation may initiate another period of thrashing, and triggers the time in which many animals more seriously injure themselves. 4. Assuming a rescued animal is OK after rescue: once the animal is removed from the incident and it walks off and eats some grass, many people assume the animal is OK when in fact its condition is about to spiral downward. Stress-induced conditions can kill the animal. Appropriate and immediate treatment can help a horse — an amazing example is Neville Bardos’ story, who was injured in a barn fire and recovered to be named the USEF International Horse of the Year. 5. Exhibiting the Ostrich Syndrome, or “it won’t happen to me”: statistics show that the two most common emergencies that occur for horse owners are trailer wrecks and barn fires. Next is a horse getting trapped in or on mud, fences, ditches or other around-the-farm situations from which they cannot extricate themselves. These events happen very commonly to horses on farms large and small, wealthy and poor, well-run and not so well-managed. They can happen to you! 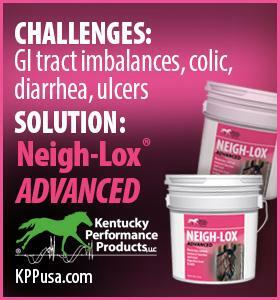 Educate yourself in ways to minimize injury to your animals, and increase your riding time with your horses. NYPD performs a vertical lift of their horse rescue training mannequin out of that mud hole with a Becker Sling – it only took 12 minutes to get the specialized equipment onto the horse for a safe extrication. At 500 pounds the mannequin provides excellent simulation for this training. We applaud the TLAER for the good work that they do. If you’d like to learn more about Technical Large Animal Emergency Rescue, please see the group’s website, follow TLAER on Facebook, and join the Facebook group devoted to TLAER.